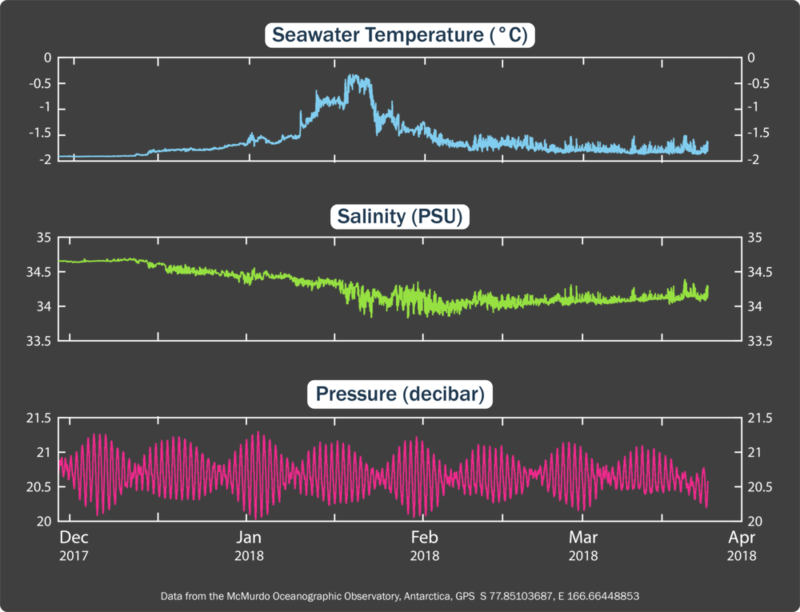 A UNIQUE DATASET – The McMurdo Oceanographic Observatory (MOO) provides real-time monitoring and a long-term record of seawater conditions from McMurdo Sound, Antarctica–the southernmost accessible marine environment in the world. McMurdo Sound is an ice-covered embayment of the southwestern Ross Sea, about 2,500 miles (4,000km) south of New Zealand. It is bounded by the Antarctic continent to the west, Ross Island to the east, and the massive, floating Ross Ice Shelf to the south. The primary coastal research outpost on McMurdo Sound, the United States' McMurdo Station, has long been a hub of marine research in this extreme southern marine environment. Yet, despite a continuous human presence on its shores for over seventy years, there has been no formal, long-term effort at seawater condition monitoring of the waters in front of the station. In this perennially ice-covered environment, using satellite sensing floating oceanographic buoys to monitor seawater conditions is unreliable and impractical. McMurdo Sound is along Antarctica's coast, only 850 miles (1,400km) from the South Pole. Since its installation on the sea floor at about about 78°S latitude, the MOO is now recording seawater condition data continuously. The salinity, temperature and pressure sensors are all contained in a single instrument called a CTD (conductivity, temperature & depth, manufactured by Seabird Scientific) that is attached alongside the other parts of the MOO at seventy-feet (21m) deep under a ceiling of solid ice that averages 8 feet-thick (2.5m). This instrument allows the MOO to collect research-quality data with extreme precision: For example, seawater temperature is measured to ±0.002°C, and the sensor package is calibrated annually to conform to international standards. With its unique dataset, the MOO is helping to narrow a critical knowledge gap in a globally important marine environment. 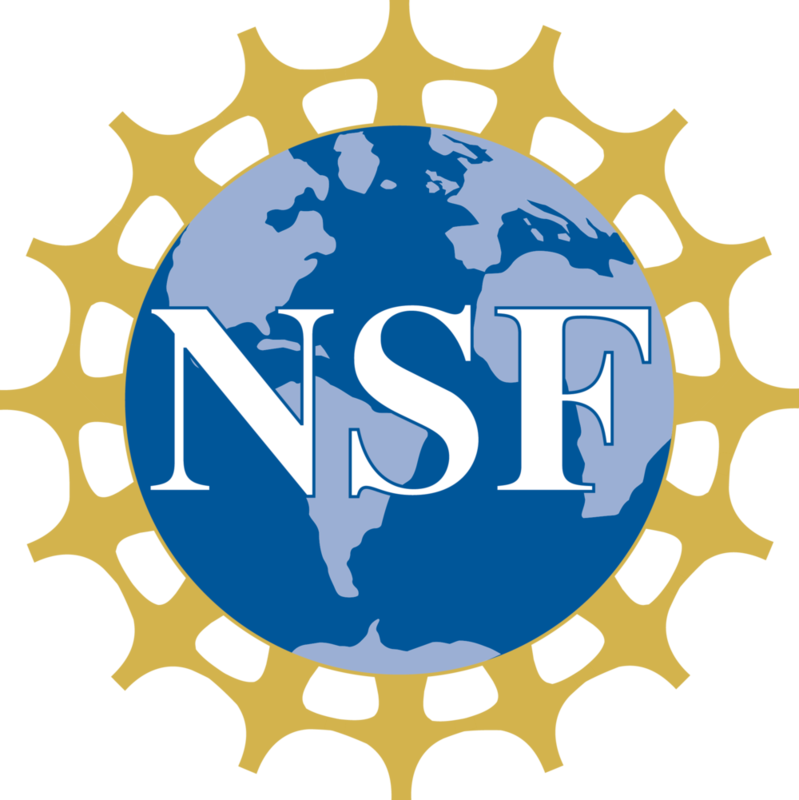 Our project is facilitating biological research projects while simultaneouly providing scientists with a better understanding of the unique oceanographic processes occurring at the southern ends of our planet. A sample of ocean condition data collected by the MOO since its installation in late 2017. Live data is available here. McMurdo Sound in the southern Ross Sea, Antarctica. Explore a map of McMurdo Sound. ICE ABOVE, ICE BELOW – McMurdo sound is home to many kinds of sea ice. For much of each year, fast ice–that which is solidly attached ("held fast") to the shore–completely obscures the frigid water below. As the Austral summer progresses, the surface cover may begin to break apart and move under the influence of winds and currents. As it fractures, it turns the ceiling of the water column into a dynamic, floating playground of pack ice for seals, penguins and whales. If the ice breaks out, which may occur in January to March, McMurdo Sound will only be ice-free for a few weeks before the freezing process begins anew. One of the curious things about McMurdo Sound, however, is that ice occurs not only on the surface of the water, but is also found attached to the shallow sea floor. This curious phenomenon is called anchor ice, so named by the eighteenth-century Antarctic explorers who discovered a shimmering layer of ice crystals covering the anchors of their wooden ships when pulled aboard. While anchor ice is indeed a form of sea ice, it is created by a different process than the familiar icy surface crust that conceals the world's frigid oceans. In contrast to the surface ice cover, which forms primarily because it is cold outside, anchor ice forms only in coastal Antarctica where seawater flushes into an out of ocean cavities beneath immense, floating masses of glacial ice known as ice shelves. In being attached to the sea floor, anchor ice's matrix of randomly-oriented ice platelets (most about the diameter of a coffee mug and no thicker than a pencil) create cavities that offer small fishes and invertebrate animals protection from predators as well surfaces to graze: Anchor ice is a unique, icy habitat. The livin' isn't all good, however. Anchor ice growth on the surface of invertebrates may smother them or float them off the bottom to be frozen into the underside of the ice cover above. We also surmise that the same freezing conditions that drive anchor ice growth on the sea floor pose a risk to fishes. Under these super-cold conditions, ice crystals may invade the bodies of the antifreeze protein-bearing Antarctic fishes, adding another layer of risk to their already tenuous survival in a near-freezing habitat. Anchor ice is a phenomenon, and habitat type, unique to coastal Antarctica. 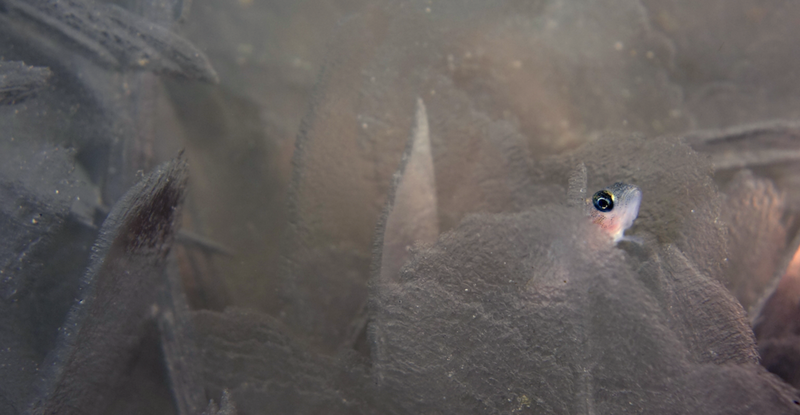 A juvenile notothenioid fish, about 1.5-inches (4cm) long, evades predators by hiding in the crevices of the anchor ice matrix on the shallow sea floor in McMurdo Sound. THE COLD CASE OF SUPERCOOLED WATER – During a typical "summer" research season at McMurdo Station (Sept. to Dec.), divers regularly observe anchor ice on the shallow sea floor. But what controls when this anchor ice grows, to what depth, and where the ice crystals that make up this undersea ice come from, remain largely unknown. For undersea ice to grow, the seawater must be supercooled, that is, in an unstable state slightly below its freezing point. Near the MOO, ocean currents and tidally-caused water movements push and pull masses of frigid seawater beneath a portion of the Ross Ice Shelf. As the near-surface water descends below the fringes of a layer of ice the size of France (and up to 800 m or 2,600 ft thick in some places), it brings heat that melts the exposed underside of the ice shelf. Because the freezing point is lowered when seawater is under pressure, like at depth below the ice shelf, the meltwater-seawater mixture equilibrates to a slightly lower temperature than it had at shallower depths. When this deep, cold, and slightly-less-salty seawater resurfaces in McMurdo Sound, it will now be at a temperature below its freezing point near the surface–it will be supercooled. The occurrence of this oceanographic phenomenon can be revealed by casting a profiling CTD (an instrument package that is lowered through the water column). For example, in the chart at right, the seawater is below its expected freezing point from the surface to about 130ft (40m) depth–a cold mass of water has infiltrated the surface layers of McMurdo Sound. 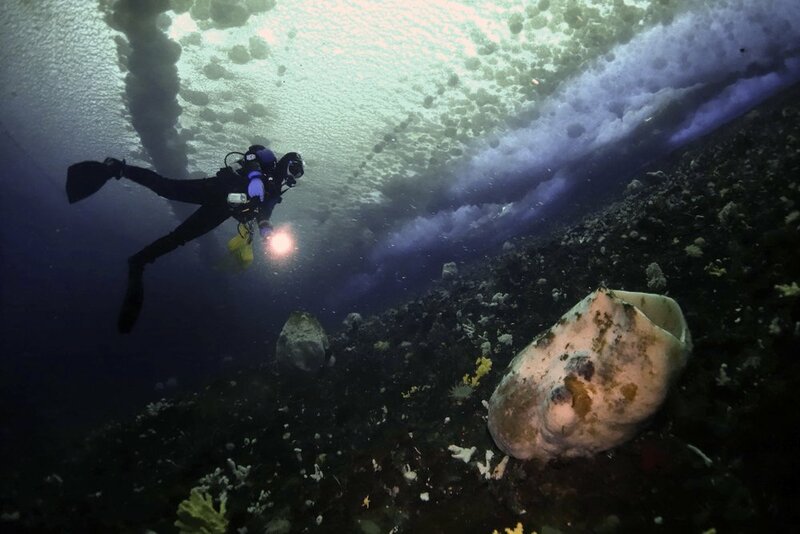 On this particular day, our divers experienced one of the most surreal "underwater snowstorms" ever recorded (see photos of diver, at right). Even during extreme supercooling events, the seawater is only barely below its freezing point (rarely more than 0.03°C, 0.05°F), but it still drives the rapid growth of ice on the shallow sea floor (anchor ice), in the water column (frazil ice), and on the underside of the sea ice cover (platelet ice). A thin rope suspended in the water column overnight may come up enshrouded in a layer of ice thicker than your leg. 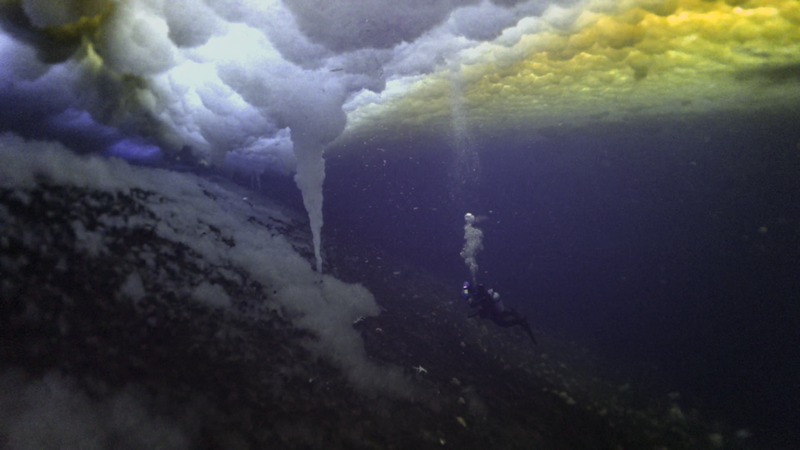 Astonishingly, when diving in supercooled waters, divers sometimes report seeing the water column full of little hexagonal ice crystals floating towards the surface–like being in a mind-boggling upside-down snowstorm (see image at right). 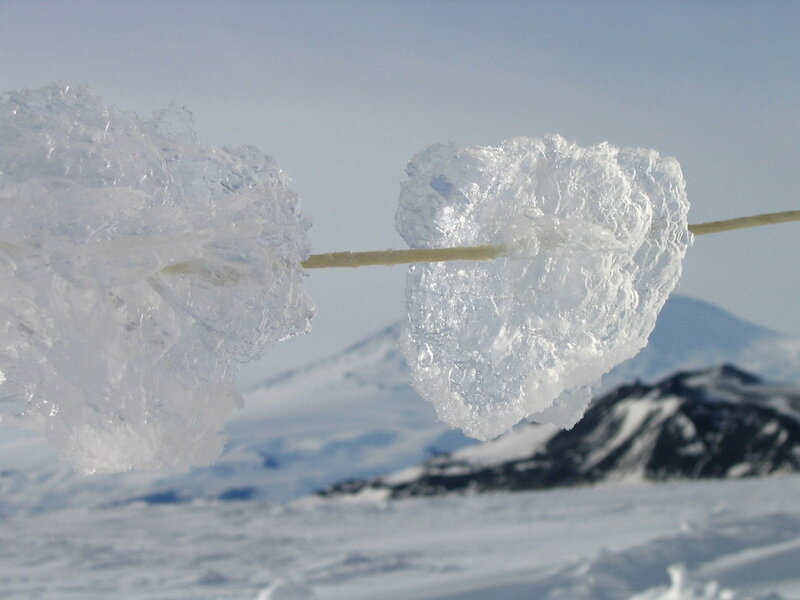 In McMurdo Sound, seawater supercooling occurs regularly, but which oceanographic factors control when, where and to what depth it occurs are still not clear. In following, no one has been able to determine why anchor ice growth–which may be a major disturbance to near-shore marine animals–is different from year-to-year and in different locations around the Sound. ONE STEP FOWARD – The MOO project aims to help resolve the mysteries surrounding the origin, temporal changes, and the biological and physical effects of anchor ice and supercooled water in coastal Antarctica. By logging oceanographic data in real time while simultaneously recording visual images year-round, the MOO will allow us to know how often supercooling occurs, document the progression of anchor ice growth and melting, and detect floating crystals if and when they occur in the water column. In supercooled seawater, ice crystals may exist floating free in the water column. Project leader Paul Cziko, swimming in supercooled seawater near the MOO, investigates anchor ice on the sea floor and ice stalactites that drain icy brine from the growing sea ice above.